The third section of the delightful Conservatory Garden in the northern section of Central Park, Manhattan, was inspired by English gardens. Here you will find a beautiful selection of trees and herbaceous borders surrounding a central, secret, water lily pool. Concentric bands of paths give a maze like structure to this garden. Greens predominate with a clever use of shape and texture. Feathery textures are also used to good effect. The water lily pond in the centre of the garden. This pond was dedicated in 1936 to the memory of Frances Hodgson Burnett, whose story of the “Secret Garden” has captured the hearts of so many, young and old. The story was originaly published in 1910 in serial format but was published as a book in 1911. It has become a classic of English children’s literature and over the years has been adapted to film and TV. This garden, like the book upon which it is based, explores the healing power of gardens, and indeed, of all living things. There is also a powerful message here that being in a quiet place amongst living things can help to bring calm to the mind, to transform negative thoughts into positive thoughts, helping both psychological and physical well being. This is a garden that gives a much needed sense of tranquility in an otherwise very busy city. The sculpture represents Mary and Dickon, the central characters of the book, who find healing of both mind and body in the secret garden they discover, a garden that had been locked away from everyone for many years. Mary holds a bowl of water for two little robins. It was a robin that lead Mary to find the secret garden. The robin had turned up some soil and it was there that Mary found the key to the garden. No key is required to enter this secret garden, just the desire to spend some time in the peace and quiet of a tranquil, beautiful space in a very big city. Simple flowers add just a touch of colour to this garden. A closer look at some of the feathery grasses. We could have stayed much longer but rain clouds threatened. The northern end of Central Park. We had to tear ourselves away from the beautiful and peaceful Conservatory Garden and head back towards the city before the rain came down. This part of Central Park is itself very attractive with undulating lawns, large rock faces and many trees, some of them not very old. Fifth Avenue near the Met Art Gallery. With the rain cloud becoming ever more threatening, we came out of the park onto the famous Museum Mile on Fifth Avenue and made our way to the fabulous Metropilitan Museum of Art. There we had lunch in the member’s lounge before spending the rest of the day being entranced by a wonderful exhibition called “Assyria” which transported us as far back as 11th century BC. You could spend many happy rainy afternoons exploring this art gallery with its changing exhibitions adding constant new attractions to the many, many permanent exhibitions. Sun shining on one of the fountains at The Met. By the time we emerged from The Met, the rain had passed and rays of sunshine were sparkling on one of the fountains in front of The Met. We made our way back to our friend’s apartment ready to relax our tired feet after what had been a truly enjoyable day in Manhattan. View down the East River, New York. And put our feet up we did as we watched barges move slowly down the East River towards Brooklyn in the late afternoon light. T’was a delightful way to unwind, again away from the chaos and hustle and bustle of New York. With a view like this to enjoy every day, I understand why our friends like to live in New York. We thank them for their wonderful hospitality… and the view. The mediaeval church of St Just-in-Penwith held a special surprise for us; two very interesting examples of mediaeval secco art. And that was by no means all that was of interest in this church. No matter what your religious persuasion, or otherwise, the story of this church is fascinating. The old market town of St Just may not have much else to offer the visitor to this isolated southern part of Cornwall, but it does have this treasure. How we found it, is part of this story. St Just was the only market town for this busy mining area along the coast. It is old, grey, stone, drab, and quite uninviting, especially on a cold, rainy, windy day. We would have driven straight through except for three things. This town has the only public toilet for miles around. I needed to find a chemist. And the Ellis branch of David’s family had lived here in times past. After satisfying the first two needs, we went to find the graveyard and pay our respects to some of David’s ancestors. Wandering along one very narrow street, we happened upon the only vestige of a garden that we were to find in the whole town. Purple Clematis adorned the wall and Campanula spilled over the wall. The sight of this tiny garden cheered me up. Then, just around the next corner, we met a very friendly man who just happened to be keen on family history. Another nice surprise. He told us that, even though we believed that the Ellis family were Quakers, by law they would have had to be buried in consecrated ground. And that meant burial either in the grave yard of the established church, until about the late 1880s, or in the Methodist Chapel graveyard after that. Since many miners in Cornwall had joined the Wesleyan Movement in the late 1700s, we went to the Methodist graveyard first. The Methodist Chapel is a large, grey, unadorned building and quite forbidding in appearance. After a search across wet, grassy, uneven ground, we did find one Ellis headstone dated 1935. So some members of the Ellis family had lived on here long after William left to go to Australia in 1850. We knew that the probability of finding any older Ellis headstones was quite remote. To begin with, they were poor miners and could not have afforded headstones. Even if they had, time would have eroded the inscriptions away and lichen and moss would have taken up residence instead. But here, at least, was the resting places of some of the family. With rain coming down and the cold seeping into my bones despite my wet weather gear, I decided to sit in the warmth and dry of the car while David went in search of the established Church. He soon came back to get me. I had to go with him to see this church. It was, he said, special. I had almost missed out on one of the real treasures of Cornwall. Let me share it with you now. From outside, this very old church showed that it had been built in three different phases. There are three separate aisles with three different window shapes. And indeed, the story of this church encompasses much of the history of the area. There’s been a place of prayer and worship on this site for over 1500 years. The first ‘cell’ or oratory belonged to St Justin, thought to have been a Celtic missionary, a native of Cornwall, who became a ‘holy man’ in the 5th Century. Four, possibly five, other celtic cells or oratories followed on this site long before there was ever a settlement here. The area became enclosed as a ‘lan’ with a small prayer and oratory chapel and several stone beehive huts. When the Normans came to Cornwall after 1066, they swept away these small buildings, using the stone to build their own form of church. By the 14th century, that Norman church had suffered badly at the hands of the wild Cornish weather. A new church was needed. And so, in 1334, the central part of this church was built in the form of a cross. A small settlement grew up around the church. It was known as “Lefrowda”: laf or lan, a Cornish word meaning a religious enclosure; rood, rode or rod, a Saxon word meaning cross or crucifix; and dha, a Cornish word meaning good. This name alone shows the infiltration of words that came into the Cornish language due to the influence of ‘outsiders’. Nowadays, the Cornish language is all but lost. Although the Normans began that change, the final impetus for that loss came as a direct result of the reformation with the introduction of the English language Book of Common Prayer and the forced change of the church litany from Latin to English. With that change there was much disquiet in Cornwall. Riots occurred, lead by Cornish churchmen, resulting in quite a few deaths. The English law came down heavily against Cornish people struggling to maintain there language and their litany. A new order was forced upon them and the Cornish language was fairly quickly lost. Is it any wonder that, to this day, Cornish people refuse to think of themselves as being English. In the 14th and 15th Centuries, the cruciform shape of the main church was lost when the two side aisles of the church were added . The town that grew up around the church took on a new name, St Just; and another piece of history was told through the story of this church. When you first enter the church, it is dim. As your eyes adjust to the gentle light, you can see how the light coming through the main window reflects off the amazing collection of grey granite stones that make up the very thick walls. Behind the altar is a very unusual and beautifully carved Reredos set into two dimly lit alcoves. Made of Derbyshire Alabaster, the carvings represent fourteen Cornish Saints. This Reredos was presented to the church in 1896. It’s the first of the interesting works of art to be enjoyed in this church. The walls inside the church show clearly the random, rubble type of granite construction often used in Cornwall. In most other churches, this is not visible since it was the custom to cover the rubble with plaster and whitewash. But here, the plaster was stripped away in about 1865 when the church underwent restoration. The light grey granite is now accentuated by black pitch pointing. Stripping off the plaster during the restoration of the church, also revealed very different qualities of workmanship between the north and the south aisles. And that tells another part of the story of this town. Work on both of the new side aisles of the church started in the 14th century. However, the North Aisle was finished fifty years earlier than the South Aisle and is much more carefully constructed. Why should that be? The answer; before the South Aisle could be finished, Cornwall was hit by the plague; the Black Death. The population was decimated and all work on the church ceased. Much later, in the early part of the 15th Century, the South Aisle was finally completed, but somewhat more roughly than the North Aisle. But the pillars (the capitals) were completed by some very skilled craftsmen. Each pillar was richly carved with its own distinctive 15th century design. These designs include an assortment of shields, vine leaves, roses and quatrefoils. The font, also, was beautifully carved. One of the paintings (above) depicts Saint George, patron saint of England, representing all that is good. He fights the dragon which represents all that is evil, wrong and impure in the world. It is one of six secco murals that were originally painted in this church, each a visual depiction of some lesson to be taught to the mostly illiterate congregation. After the Reformation, all such works were to be destroyed. Here at St Just, the paintings were simply covered in whitewash. Over the centuries, many more coats of whitewash covered the paintings. They were forgotten. It was not until restoration of the church commenced in 1865 that their existence was rediscovered. However, much of the art work was destroyed by the workmen who were employed to strip the whitewash off the walls with axes. Only two have survived somewhat intact. St George is one of them, but this painting was mostly overpainted during the restoration of the church. Not much of the original mediaeval paint survives. In the second secco painting, much more of the original art work survives. 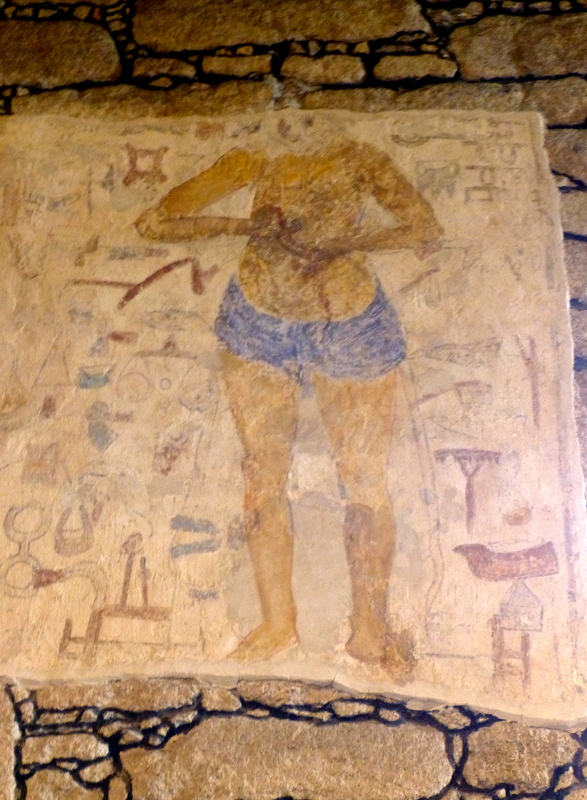 Also painted on the wall of the North Aisle, this work is known as “Christ of the Trades”. It represents Christ blessing the work tools of the various occupations of the people of the town at that time. It gives us a glimpse into the lives of the people who were part of this congregation. Some of the tools depicted include a fisherman’s reel, an axe, a shoemaker’s knife, a carpenter’s chisel, a wall candlestick, a turf cutter, a mason’s trowel, a cooper’s adze, a wool carder’s comb, a bit for a horse’s mouth, a sickle, shears for cutting cloth, a thatcher’s comb, an anvil and bellows. In a note regarding the future preservation and conservation of the paintings, mention is made the problems associated with the prevailing westerly winds and abundance of rain in West Cornwall. We had personal experience of both of those. Other items of interest in the church also told something of the story of this area. In these churches in the mining areas of Cornwall, there are often memorials to the wealthy owners of the local mines. This church is no exception. The Lady Chapel East Window is just one of three windows in this church dedicated to the Harvey James family who were formerly the owners of the local Botallock Mine. It’s has delightful floral and palm tree styled traceries. I wondered what miners and their families thought of these windows knowing that it was their hard work that really paid for them. In most churches, each person, or group of people, had their designated places to sit, or stand, within the church. Personalizing the end of their special pew with a carving was just another way that the mine and land owners displayed their wealth within the church. One example is this beautifully carved wooden pew end which bears the date 1625 and the initials JB. The carving is of a coat of arms; merging the coats of arms of two local land owning families – Arundell and Bosavern. Three shells down the centre are flanked by six swallows, three on each side. After almost four hundred years, it was in remarkably good condition. The organist was practising a few pieces while we wandered around the church and that gave it a warm, ‘used’ feeling. Some of the churches we visited on this trip felt very cold and unloved, signs of waining church attendance. As we left the church, I noticed some tiny flowers growing in the outer stone work. I also noticed that the weather had cleared somewhat and that meant we could go out onto the moors again to enjoy the wildflowers. More of that anon.